Comparing long term performance of RH measurement instruments involves more than simply comparing the humidity sensor accuracy specifications listed on the datasheets. The Accuracy specification provides only part of the information needed to determine overall instrument performance. 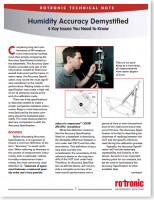 In some cases the Accuracy specification may not even be the most significant contributor to the overall performance creating a risk of potential unexpected out of tolerance results at the end of a calibration cycle. Click here to download the Technical Note "Humidity Sensor Accuracy Demystified".